We’re both working full-time. Leo is in preschool full-time. This week, I’d like to deliver a state of our family address. By which I mean, this week, I wanted to throttle my husband and call in sick. “You have been away, our childcare fell apart, I had a weeklong-stomach bug, Leo developed the habit of trying to piss me off and you were anxious and distracted whenever you were around,” I’ll point out pleasantly. “You said I could go, and it’s not like I was sleeping in and partying, I was working, and traveling, it was really hard,” Aaron will reply. 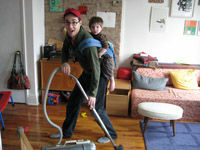 “Is there any housework you need help with?” Aaron will inquire. “ANY HOUSEWORK I NEED HELP WITH? I?! YOU MEAN FOR MY HOUSE? !” I’ll respond. “I will take care of our vacuuming, how’s that?” Aaron will say, running for cover. “Do you realize your son needs you? Do you realize he’s being fed factory-farmed burgers? ” I’ll shout at Aaron’s back while the son in question attempts to insert foreign objects into the DVD player. “How about I watch Leo while you make lunch?” Aaron will ask. And that, friendly readers, is how I made Squash and Escarole Ragout with Beans while Aaron strapped our gangly nearly-two-year-old onto his back and vacuumed up the snowdrifts of hair that our cat seems to spontaneously release whenever things get stressful. Not that anyone’s stressed around here. After lunch, Leo sleeping off an enormous plate of penne, I’ll notice that we’ve eaten a healthy meal, the house is clean and our child is taking a nap.